If you missed Lewis Black last month - he performed at the Opera House in Mid-May and it was hilarious (except for the idiot who kept heckling him from the balcony) - here's your chance to meet him. Lewis Black will be at the Border's in Downtown Crossing on Friday, June 6th. He'll be signing copies of his book "Me of Little Faith." The book signing is at 1pm, so sneak out during your lunch break. Or heck it's Friday, for those of you out there that have "summer hours" you'll probably be leaving work already at that time. 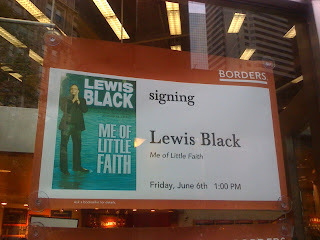 0 Response to "Lewis Black Book Signing - 6/6"